Bill Fletcher and Naomi Klein taking questions at the opening plenary. Many of the papers from the conference are hotlinked from the list of sessions. Watch musician Witt Wisebram and poet Alice Lovelace at the Saturday Morning Plenary. Play (45min) or download (32MB) the audio. David Applebaum and Elizabeth McKillen present tributes to Alan Dawley. Listen to the Saturday evening plenary session with two leading scholars on the Middle East: Zachary Lockman (play [37 min] or download [8MB]) of New York University and 2006-2007 president of the Middle East Studies Association, Dina Rizk Khoury of George Washington University (play [34 min] or download [8MB]), question and answer (play [28 min] or download [7MB]). Read notes from some sessions in The Hawblog and from Jan Adams. Historians Against the War and the Peace History Society invite you to our upcoming national conference at Georgia State University, Atlanta, Georgia, 11-13 April 2008. We want to attract historically minded scholars, activists from a variety of social movements, graduate students, educators, artists, and independent researchers and writers. The conference will begin on Friday evening, April 11 with two keynote addresses. The speakers are Bill Fletcher, Jr., a longtime activist in the labor and black freedom movements who has been president of the TransAfrica Forum and education director of the national AFL-CIO; and Naomi Klein, author of the books No Logo and The Shock Doctrine. Both speakers have now been confirmed. During three time slots on Saturday, April 12 (and a fourth time slot Sunday morning, April 13) there will be a total of twenty-one panels, roundtables, and workshops on a great variety of topics relevant to the overall theme of the conference. Click here for a list of these sessions. The Saturday evening plenary session, 5:00 – 6:45, will feature two leading scholars on the Middle East: Dina Rizk Khoury of George Washington University and Zachary Lockman of New York University, 2006-2007 president of the Middle East Studies Association. Please help us build this conference by spreading the word to scholars and activists! Conference flyer (in PDF format). Historians Against the War is a network of history teachers, scholars, and activists seeking to bring historical analysis to bear on U.S. foreign policy and its social/political impact. To find out more, visit the HAW website at www.historiansagainstwar.org. Peace History Society encourages and coordinates national and international scholarly work to explore and articulate the conditions and causes of peace and war, and to communicate the findings of scholarly work to the public. To find out more, visit the PHS website at www.peacehistorysociety.org. 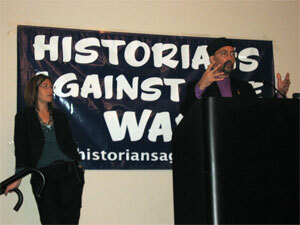 The first HAW conference "Empire, Resistance, and the War in Iraq: A Conference for Historians and Activists" was held at the University of Texas, Austin, February 17-19, 2006.